A beautiful smile can be a really good asset. It’s easy to lose your confidence once you feel self conscious about your teeth. It just makes sense that a person wants to have the prettiest smile unfortunately not everyone is gifted with perfect teeth. Did you know that there’s a close relationship between bad teeth and self- satisfaction? It might seem shallow, but the truth is, if a person has yellow or crooked teeth then they are likely to feel insecure around other people. If you have the same problem, then you should know that there are different ways to fix this. The good news is, having your teeth whitened or replaced is such a simple procedure. Dentists in Bangkok along with our Phuket Dentists are now offering fantastic new ways to restore the teeth to its natural and beautiful look through tooth-colored fillings. Because of the continuous improvement in the field of dentistry, gum grafting,composite fillings,vaneers and mini-dental implants can be done in the most natural looking way possible. Dental restoration is a process wherein a dentist replaces the missing teeth or restores a broken tooth structure using multiple dental procedures such as a sinus lift, dental bridge or crowns. There are many reasons why a tooth needs to be replaced. It can be because of a previously fractured tooth, decay, or it was previously restored but it has deteriorated. If any of these cases isn’t treated, it can result to potential loss of teeth or a feeling of constant discomfort. Stop the pain and discomfort by taking a dental vacation to Thailand for your new smile via a complete dental makeover that’s light on your bank account also. To get actual prices and multi-tooth discounts please call or email us. The most common type of dental restoration are with the aid of dental fillings. There are a variety of materials to use for fillings. In the past, amalgams that are made of gold or silver have been used to fill the cavities. Nowadays, because of the advances in the world of dentistry, an option for natural tooth-colored filling is available. There are two different types of tooth-colored fillings we offer at the Thai International Dental Center, in order to know which one is best for you, you can decide with the help of your dentist. The materials used for fillings come in different shades that match different people’s natural tooth color. The strength of the tooth-colored filling is not as high as silver or gold but it still does its job well. Composite Resin Dental Filings– Also commonly known as the white filling; composite resin is a glass mixture of plastic used to restore fractured or decayed teeth. 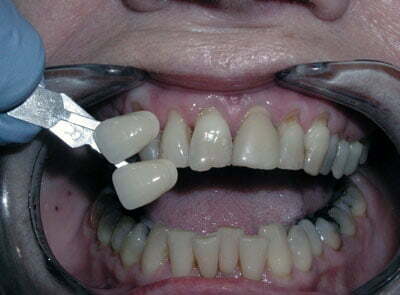 The main advantage in choosing composite fillings is the aesthetics. 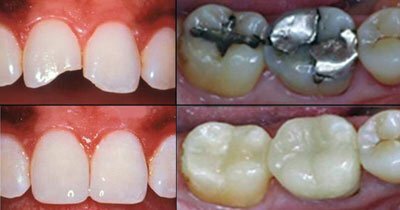 It is less noticeable than amalgam especially if it’s done in the back tooth. Ceramic Fillings in Bangkok- Typically made of ceramic, porcelain or glass-like filling; this is the perfect alternative to having metal in your mouth. Ceramic filling is much more resilient than metal, it provides great protection and can last for more than 15 years if taken care of well. Choosing tooth-colored restoration has many advantages. 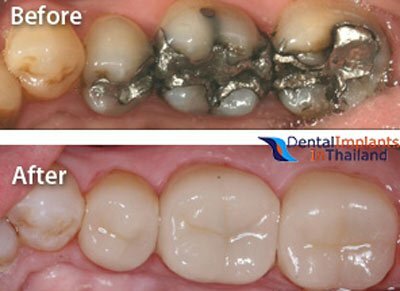 Amalgam fillings contain mercury and studies show that this can potentially present health risks. While white fillings are made of glass or plastic, it is completely safe to use. If you do not want to see silver or gold in your mouth, then tooth colored restoration is the best way to go. 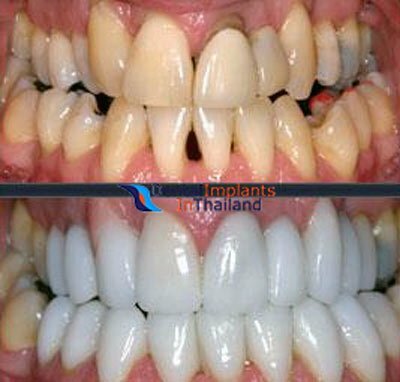 To learn more about natural tooth color restoration or for a no obligation dental makeover vacation to Thailand please contact us today.